Dancing dolphins and other creatures of the sea! This week we’ve been on the move, sailing north while trying not to melt in the early summer heat. We drink gallons of water each day, and sweat it right back out. We have gotten very crafty with creating shade on the boat, and have come to truly understand the need for an occasional siesta. The heat simply zaps all motivation from your body and all you can do is lie still and try to think cool. I was watching the gulls on the dock yesterday and they were sprinting across the hot planks to find a shady spot to sit! We’re currently moored in the marina in Santa Rosalia, where the smell of pelican poop roasting in the sun greets you as you exit the boat. It’s a very small and sadly, a dilapidated harbor, but it still has a lot of charm. The town of Santa Rosalia is a true Mexican working town, with zero tourism, only a handful of gringos, and lots of friendly locals. This area was originally settled as a copper mining settlement started by a couple of Mexican men in 1860 who had 11 mines and shipped the copper to Europe. France soon bought the entire operation and in 1885 the Compagnie du Boleo expanded the copper mining extensively. By 1910 they were producing 366,000 tons of copper a year. In the 1930’s the operation was broken up into lots of smaller outfits, and eventually in 1986 the mines and the smelter were all shut down. We plan to go visit the mining museum and do some walking up to the old copper mines (and take some pictures, no doubt!). It’s a beautiful area, with lots of traditional European style architecture. There is even a steel church that was originally built in Brussels by Gustave Eiffel, the creator of the Eiffel Tower. The church was purchased by the Compagnie du Boleo, disassembled, shipped around the world to Santa Rosalia and reassembled in 1897, where it is still in use. Now that you know where we are, here’s a photo journal of where we’ve been the past two weeks! We started moving north from Puerto Escondido, and stopped at Isla Coronados where we were mesmerized by the colors of the water (see last post..!) While we were anchored off the white sand beach under the red rocks of the volcano we noticed that there seemed to be a “panga convention” going on; about 20 pangas lined up onshore. As it turned out, they were setting up tables and chairs, tents and an altar, for a beach wedding. Isla Coronados is close to Loreto, so pretty soon the pangas started shuttling couples and families from Loreto to the beach. The bride and groom walked hand in hand down the beach to the sounds of live guitar music and crashing waves. It looked and sounded like they were having an awesome time, then the pangas started shuttling everyone home! Talk about a destination wedding! Yet another selfie in paradise! Morning coffee and a show..
From Isla Coronados we sailed to Bahia San Juanico, a huge rocky bay that was a paradise of chocolate clams, fishing mornings, snorkeling afternoons, and osprey watching. For a special bonus on the way in we were engulfed by a pod of 100-200 dolphins! It was quite a sight to see the water boiling in the distance followed by the sounds of the dolphins racing toward us. Pretty soon they caught up to us and literally surrounded us. We were one with the pod…ha! The sounds of that many dolphins jumping and blowing all around is surreal. They gave us a great show, and then suddenly they were gone! Osprey nest on the pinnacle! We each caught one..matching trigger fish! This guy was huge…too big and too close for the camera! After San Juanico, we headed for Bahia Conception, which is a large narrow bay that is open to the north and protected on the east by a peninsula of land nearly 25 miles in length. There are a number of anchorages in Bahia Conception, and we had planned on staying there for a while. As it turned out, we found we didn’t much like being next to Mexico Highway 1 that parallels the western shore. Arriving as we did in the heat, the communities were literally boarded up, and most of the RVers and campers were gone. As one local told us; “They turn off the generators from June 1 to October 1, when all the gringos go home”. With the heat, the traffic, and the less than clear water in the bay, we decided to keep heading north to find a better spot to melt. 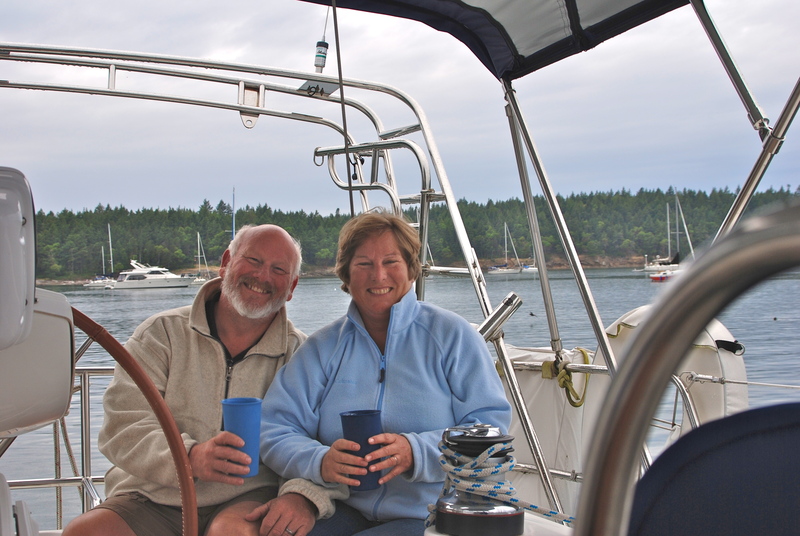 We left Bahia Conception and sailed on a brisk breeze to Punta Chivato. There is a small anchorage there that gave us plenty of protection from the NE winds. We took a quick trip over to “shell beach”, which is aptly named! Shells so thick you’d need a shovel to get to the bottom. Fun to explore, but not when barefoot. We keep forgetting to wear shoes, so our exploration was cut a bit short! And that brings us back to Santa Rosalia where we are now. Along the way we were entertained by two different pods of pilot whales, the first we’ve seen. They were quite active and looked as if they were working together; lined up in a chorus line and slowly closing the line into a circle, trapping the prey in the center. There were also a few dolphins following along with them and they started doing these huge leaps out of the water right next to the boat…it was wild! Which way are we going?? We’ll be in Santa Rosalia for a few days while we wait until the propane store is open so we can fill our tanks, and Marty gets his baseball team to behave. Then we’ll untie the lines and head for an even more remote part of the Sea of Cortez, away from towns or highway 1. We’ll be up in Bahia San Francisquito and Bahia Los Angeles, and the islands nearby. Our plan is to stay up in that area for the month of June (if we don’t melt first), then head back here to Santa Rosalia, before crossing over to San Carlos on the mainland side of the Sea. The plan is to be in the San Carlos area for July / August, so if anyone wants to brave the heat and come visit, let us know! You’ll be able to pack really really light…except for all that sunscreen! Okay, enough rambling, and probably more than enough dolphin pictures; hope you enjoyed this week’s show and tell! We enjoy sharing photos of our latest meanderings and moments of awe. Another great updat from the Happy Dance. I so look forward to hearing from the dancers. Stay cool. Ted E.
nice to hear of your adventures and I loved, loved Shell Beach! With shoes and cooler weather it would be a great to shift thru the shells for a treasure. it probably never gets old to see all the dolphins and other sea creatures so close you could touch them…what fun! Glald u are safe and ‘alone’ in the heat. hope Marty’s hand has healed nicely. talk later.